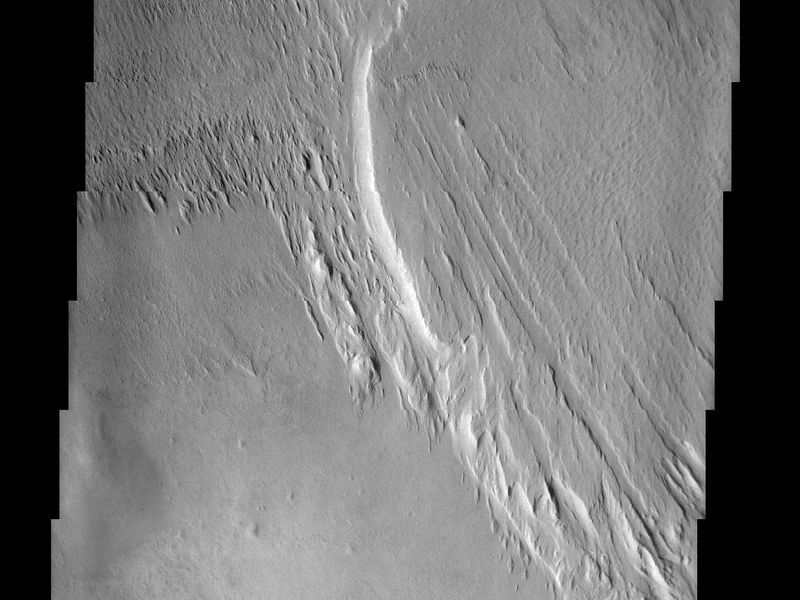 This THEMIS visible image was acquired near 7°S, 172°W (188°E) and shows a remarkable martian geologic deposit known as the Medusae Fossae Formation. 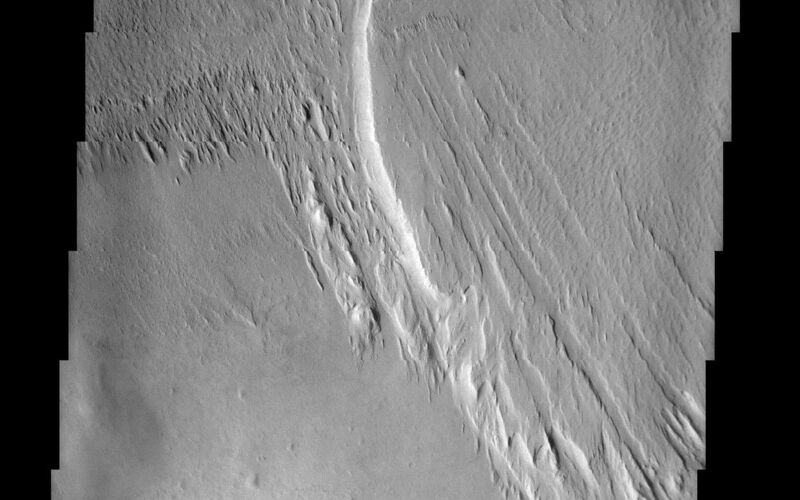 This Formation, seen here as the raised plateau in the upper two-thirds of the image, is a soft, easily eroded deposit that extends for nearly 1,000 km along the equator of Mars. In this region the deposit has been heavily eroded by the wind to produce a series of linear ridges called yardangs. These parallel ridges point in direction of the prevailing winds that carved them, and demonstrate the power of martian winds to sculpt the dry landscape of Mars. The Medusae Fossae Formation has been completely stripped from the surface in the lower third of the image, revealing a harder layer below that is more resistant to wind erosion. The easily eroded nature of the Medusae Fossae Formation suggests that it is composed of weakly cemented particles, and was most likely formed by the deposition of wind-blown dust or volcanic ash. Several ancient craters that were once completely buried by this deposit are being exposed, or exhumed, as the overlying Medusae Formation is removed. Very few impact craters are visible on this Formation, indicating that the surface seen today is relatively young, and that the processes of erosion are likely to be actively occurring. Medusa of Greek mythology fame, the name-giver to this region, had snaky locks of hair that could turn a person to stone. Wild and unruly, this monster of the underworld could certainly wreak havoc on the world of the human imagination. As scary as she was, Medusa would have no advantage over the fierce, masterful winds blowing across Mars, which once carved the streaky, terrain at the top of this image. Wild and whipping, these winds have slowly eroded away the "topsoil," revealing ancient craters and other surface features they once covered. The loosely cemented particles of this "topsoil" are likely made up of dust or volcanic ash, and are thus more susceptible to windblown erosion. The Martian winds have actually been strong and relentless enough over time to strip the land in the bottom of this image of the material that once covered it, leaving it hard and bare to the eye.